Despite its association with the Ealing group of comedies which gained popular national and international acclaim during the early 1950s, Hue and Cry actually represents an accidental success that gave the studio a particular identity in much the same way as horror eventually defined Hammer Studios in the late 1950s. As Vincent Porter notes, both studios came “to represent something intrinsically and culturally British”, a particular ideological goal of Ealing’s production chief Michael Balcon (1). Taking charge of the studio in 1938 after several years managing Gainsborough and Gaumont-British, as well as an unhappy period running the British branch of MGM Studios, he soon formed a creative elite known as Mr. Balcon’s “Young Gentlemen”. In so doing, he utilised some of the approaches of MGM’s “boy genius” Irving Thalberg “to work on ideas that were acceptable to him in order to make films that were consistent in tone yet individually different, and at the same time to keep the studio running on an economic basis” (2). Among this group of “Young Gentlemen”, director Charles Crichton and screenwriter T.E.B. (“Tibby”) Clarke were more in tune with Balcon’s conservative vision than the more complex work of Robert Hamer and Alexander Mackendrick. Balcon’s ideology espoused a particular definition of “realism” in opposition to what he termed “tinsel”. Influenced by the British documentary movement, this discourse espoused understatement, the avoidance of excess, and the role of humour as a means of alleviating the material deprivations of post-war society. By no means did it resemble the more subversive formula for the role of humour documented by Freud in Jokes and Their Relation to the Unconscious, which aimed to lift the veil of socially-sanctioned repression to reveal a dark alternative world existing beneath, possibly resulting in a different form of society. As Charles Barr notes in his study of Hue and Cry in Ealing Studios, the film ends with normality restored and repression sanctified by Mother Church; while Joe Kirby (Harry Fowler), the film’s young protagonist and discoverer of a fiendish plot, is firmly aligned with his family. Balcon also hated “naturalism” perhaps because of its associations with the work of Emile Zola, Frank Norris, and Theodore Dreiser, and its perceived role in questioning the dominant norms of society. Balcon’s type of realism and humour aimed to ignore the contradictions of post-war society and continue the ideologically manufactured discourse of the “People’s War” (which never really existed in practice) into the post-war period (3). Despite Balcon’s supposed “socialist” leanings he was more of a liberal conservative like Prime Minister Clement Attlee, whose grandson recently remarked that he would have been at home in today’s British Conservative Party. In Hue and Cry, a group of youngsters discovers that a gang of criminals uses a comic book (The Trump) to convey coded messages involving their next activity. (The Trump is modelled on such boys’ own comics as The Rover and The Wizard which, unlike their successors, relied on text rather than images to tell their stories.) Ignored by authority figures, they track down writer Felix H. Wilkinson (Alastair Sim) who has no idea that his text has been altered. Eventually Joe discovers that his Covent Garden employer, Nightingale (Jack Warner), is behind the enterprise. After mobilising as many boys as he can, Joe overcomes his adversaries. The film ends with Joe reading a hymn book rather than the “shocker” which began the film. His energies finally become “sublimated into community spirit” and social activity, with Joe placed inside the church rather than outside as in the film’s beginning (6). Hue and Cry may be regarded as harmless whimsy. But it actually operates by opposing alternative trends within British society that T.E.B. Clarke’s The Blue Lamp (1950) continues. 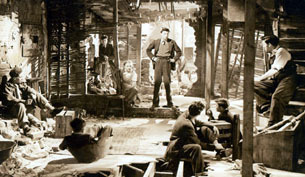 As many critics have noted, Hue and Cry‘s final confrontation is an early draft for The Blue Lamp‘s mobilisation of law and underworld against gangster Tom Riley (Dirk Bogarde), who along with his girlfriend (Peggy Evans, a younger version of Rhona [Valerie French] in Hue and Cry and Jean Kent in Good Time Girl  is regarded as a threat to the status quo. Despite its comedy overtones, Hue and Cry is Balcon’s attack on such competing trends in British cinema as Gainsborough’s female-orientated “tinsel” fantasies and those “morbid burrowings” populated by Eric Portman’s various male psychopathic characters that represent British film noir (7). Alternative possibilities for the characters do exist within Hue and Cry but only to be marginalised within the narrative. Young Joe and his friends read The Adventures of Selwyn Pike. Based on “The Sexton Blake Library” (which would employ fantasy writer and New Worlds editor Michael Moorcock a generation later), Pike represents an Americanised detective figure antithetical to the world of British “good taste”. When Joe reads the adventures on a train, a very un-Ealing use of space occurs; a fragmented image to the right of the frame replays what Joe reads using action motifs foreign to British cinema. Pike’s creator, Wilkinson, emerges as a dotty, eccentric writer rather than the sinister figure evoked by the voice from his dictaphone which Joe and Alec hear as they ascend a Gothic staircase. The appropriation of his narrative by criminal elements represents Balcon’s warning to writers who stray away from Ealing’s boundaries of common-sense “realism”. When Joe later pursues Nightingale in a bombed out building, the off-screen laughter of his antagonist evokes the sinister overtones of Wilkinson’s voice on the dictaphone. Similarly, when Joe previously confronted Nightingale in his warehouse, the latter’s face is lit by lighting techniques redolent of classic film noir. populated by Eric Portman’s various male psychopathic characters. Hue and Cry eventually reveals the “fantastic” as “real” by exposing its artificial construction in order to eliminate it from the narrative. Thus the film can end with Joe finally reconciled with his parents in church singing the hymn “O for the Wings of a Dove”. He escapes both the lures of the fantastic as well as consideration of the implications of the bombed out landscape outside. Michael Balcon’s Andy Hardy has finally come home. Like Louis B. Mayer and other Hollywood executives, the Jewish Michael Balcon aimed to remove most traces of ethnicity from his films in order to manufacture the same type of homogenous cinematic “international” entertainment that his overseas studio counterparts did. His strategy bears certain similarities to those documented by Neil Gabler in his study of studio executives, An Empire of Their Own (8). Thus the Jewish-looking Harry Fowler becomes the Cockney Joe Kirby, living in a British working class family little different from that evoked by Noel Coward in his play This Happy Breed (1943), and filmed by David Lean two years later. Joe’s dad represents something close to Coward’s conservative attitudes when he expresses displeasure at the emergence of a youth culture able to earn two pounds a week: “At his age, I couldn’t afford girls.” Women also do not fare well in Ealing. Valerie French’s Rhona is the “femme fatale” mistress of Nightingale. As the one token female tolerated by Joe, Clarry (Joan Dowling) is generally marginalised and sometimes scorned by the male group. Although a black population existed in the East End of London at this time, the youngsters who mobilise against Nightingale and his gang are all white. While young black actors may have been conspicuous by their absence at this time, this does not excuse the lack of different ethnic groups among those boys called to adventure in the climactic scenes. Hue and Cry is a comedy. But who is the joke really on? Vincent Porter, “The Context of Creativity: Ealing Studios and Hammer Films”, British Cinema History, eds. James Curran and Vincent Porter, Weidenfeld and Nicholson, London, 1983, p. 179. See Angus Calder, The People’s War, Jonathan Cape, London, 1969; and The Myth of the Blitz, Jonathan Cape, London, 1991. Charles Barr, “Projecting Britain and the British Character: Ealing Studios, Part I”, Screen vol. 15, no. 1, 1974, p. 113. Quoted in Charles Barr, Ealing Studios, Cameron and Tayleur, London, 1977, p. 94. Barr, “Projecting Britain”, p. 109. See Robert Murphy, Realism and Tinsel: Cinema and Society in Britain 1939-1949, Routledge, London, 1992, pp. 168–190; Tony Williams, Structures of Desire: British Cinema 1939-1955, SUNY Press, Albany, 2000, pp. 97–122; and Tony Williams, “British Film Noir”, Film Noir Reader 2, eds. Alain Silver and James Ursini, Limelight Press, New York, 1999, pp. 257–259. Neil Gabler, An Empire of Their Own: How the Jews Invented Hollywood, Crown, New York, 1989.